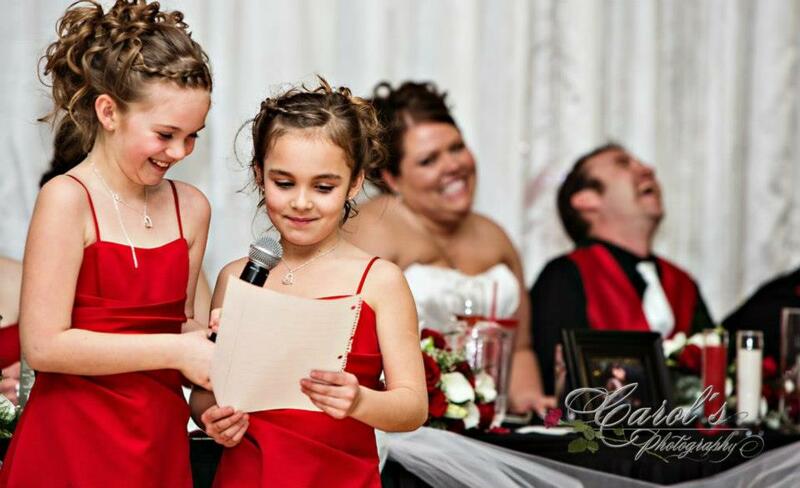 Traditionally in Canada, people often spend their time behind a podium as they offer special words at a wedding reception. Those words might be a toast to the bride, a memorable uncle welcoming his nephew’s new bride to their large extended family, etc. My suggestion for today is that you remove the podium. New moments of magic might be created as a result. Those moments might be created by having the Maid of Honour simply stand from her place at the head table, close to her best friend that she’s speaking about. Others might be to have the father of the bride come up and stand behind or next to the bride & groom, one hand resting gently on his daughters shoulder as a range of emotions move over her face. In the case of this photograph, captured by the talented Carol of Carol’s Photography in Yorkton, Saskatchewan, the moment included Chad’s incredibly sweet daughters. They were delivering a surprise speech that I’d encouraged them to create for their dad and Kyla. When they asked me where to stand, hoping for a moment like this, I suggested they stand in front of the head table so that we could see all four of them in one easy and clear view. Thanks so much again to Carol for capturing such a beautiful moment, that wouldn’t have been possible, had a podium been used. Podiums have their place, but creative staging can sometimes lead to more magical moments and memories… such as this.